This chicken and chorizo stew recipe is hearty but elegant, and is great to make in advance of people coming over. For the chicken, preheat the oven to 190C/375F/Gas 5. Heat the oil in a large ovenproof frying pan and add all the chicken pieces to the pan. Cook for 10-12 minutes turning frequently until evenly browned. Remove with a slotted spoon and set aside. Add the chorizo and shallots to the pan and fry, stirring frequently for five minutes, or until softened and the fat is beginning to run from the chorizo. Sprinkle in the flour and stir to coat. Gradually pour in the cider and stock, stirring continuously until boiling and thickened slightly. Stir in the mustard, season well with salt and pepper and return the chicken to the frying pan. Cover the frying pan with aluminium foil and cook in the oven for 35-40 minutes, or until the chicken’s juices run clear when pierced with a skewer. For the celeriac mash, place the celeriac in a saucepan and cover with water and a squeeze of lemon juice. Bring to the boil, then reduce the heat, cover and simmer for about 15 minutes, or until tender. Drain the celeriac well and tip it back into the pan. Mash over a low heat with the butter and single cream. Season with salt and white pepper. 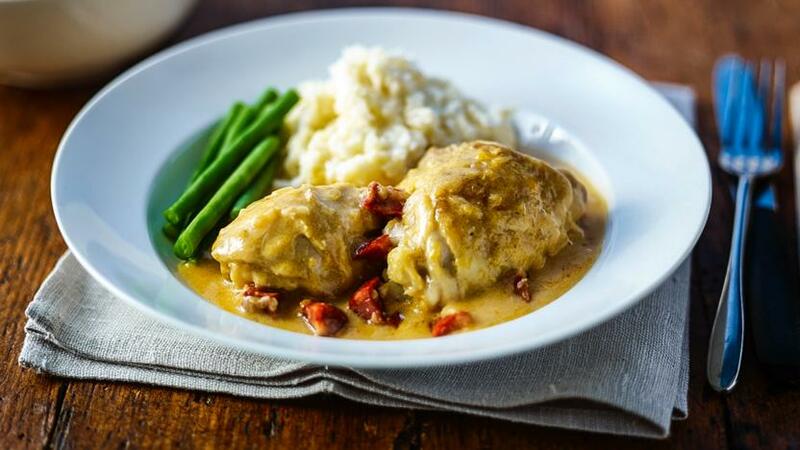 To serve, stir the double cream into the chicken liquor and serve the chicken and sauce with the celeriac mash and steamed green beans.